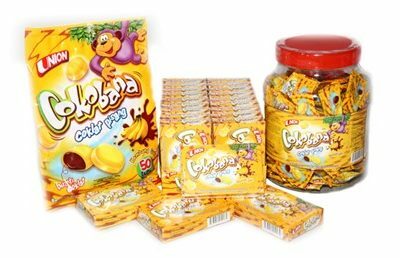 DEPOSITED CANDY WITH BANANA AND CHOCOLATE FLAVOR. PACKING/CARTON: 4 G X 50 PCS X 20 BAGS. PACKING/CARTON: 3.2 G X 7 PCS X 24 PACKS X 12 BOXES. 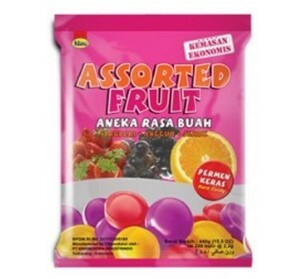 Hard candy available in 6 flavors in bag (Assorted fruit, Tamarind, Apple, Coffee, Honey lime, Barley Mint), 2 flavor in string (Smile Mint & Twistie butterscotch and grape milk). 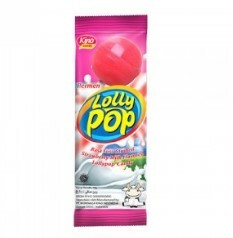 Lollipop Candy with various sweet flavour (Chocolate milk, strawberry milk, grape milk) to lift up your mood. Available in bag & string packaging.